Do Democrats’ words matter, even if their climate policies are gutless? It depends on what the public says next. The recent confirmation of Gina McCarthy—a tough air regulator with a passion for reining in greenhouse gas emissions—as head of the Environmental Protection Agency and Obama’s “national climate action plan” speech at Georgetown University last month signal two things about climate change politics in the United States. One is a glimmer of hope for modest if inadequate policy change. The other is the beginning of badly needed cultural change. For years, climate change has been one of the great political unmentionables. In the autumn of 2012, after months of crippling drought, a federal drought researcher told me he would infrequently bring up climate change during public lectures. But farmers in the heartland might sometimes ask him privately whether climate change was real—at the end of a talk, while their peers weren’t listening. Such reticence may be common among state, local and federal agencies that deal with the public. In an in-depth story this month, Mother Jones reports that even after Hurricane Sandy ravaged the East Coast, it has been difficult for emergency managers at any level of government to speak directly about the threats of climate change. Perhaps it’s fortunate then that Obama rode in to his second term after a heat wave and a megastorm. An uptick in public interest on climate change, following the scorching 2012 summer and Hurricane Sandy, has shifted a few things in the Democrats’ strategy in the past couple of months. According to a bipartisan poll released a few days ago, Obama’s base of millennial voters is especially concerned: 79 percent of under-35 voters are more likely to cast a ballot for candidates who support Obama’s climate policy; 73 percent believed that candidates who denied the science of climate change were out of touch, ignorant, or crazy. National Journal reports that climate policy is the Obama camp’s new campaign tactic. Organizing for Action, the nonprofit that helps maintain Obama’s network of grassroots supporters, plans to send volunteers to public meetings later this summer to lambast climate deniers in Republican districts. 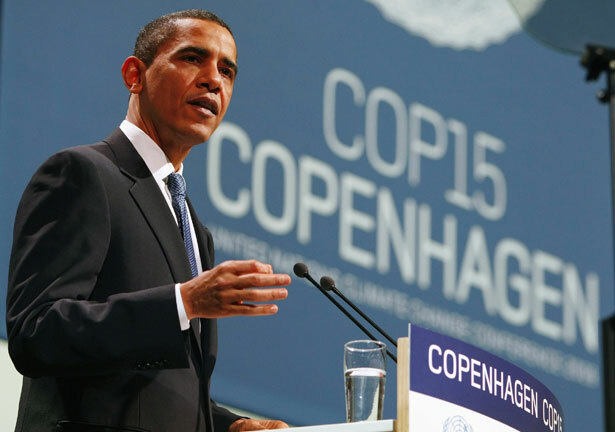 Some analysts have been quick to make the connection between public interest and Obama’s newfound outspokenness on climate (and to blast the policies he has outlined, whose details are not ambitious). But there is perhaps a more interesting potential cause-and-effect relationship: the influence of Obama on public interest. Textbook opinion research says the views of political leaders weigh heavily on public thought. Last year, researchers at Ohio State University concluded that political leaders had more influence on whether Americans were worried about climate change than any other single factor, including the economy and the views of scientists. Of course, talk is proverbially cheap, and no replacement for action. According to analysis by Northwest think tank Sightline Institute (full disclosure: my former employer), the new Obama plan is a mostly a gutless promise to let the EPA slowly launch some modest regulations on power plants. But talk is still the precursor to action. And political research says that even a small amount of talk, from a small minority (just 10 percent) of the public, can be enough to ultimately shift the majority opinion. Even if Obama’s policies are facile and Democrats’ motives disingenuous, talk can matter—if and when it ever becomes significant enough to rouse the public, to change the headlines, to make it possible to talk directly about the threats of climate change and the task of reining in greenhouse gases. Allison Kilkenny writes about the activists who are done of empty words.